Developer Crytek, best known for the system-punishing Crysis PC games, surprised many when they announced their mobile project, Fibble. Fibble, which became available for iOS devices yesterday, is a bouncy, cartoonish, colourful casual game. My immediate impression, on playing through the first few levels, was that this is what happens when Angry Birds meets mini golf in a Katamari world. You're a tiny alien, and you roll around when flicked. You need to navigate progressively more complex race courses — dotted throughout a human home — in as few moves as possible. A number of level-enhancing widgets appear along the way, in the form of little alien friends who give you the ability to jump, change direction and so on. 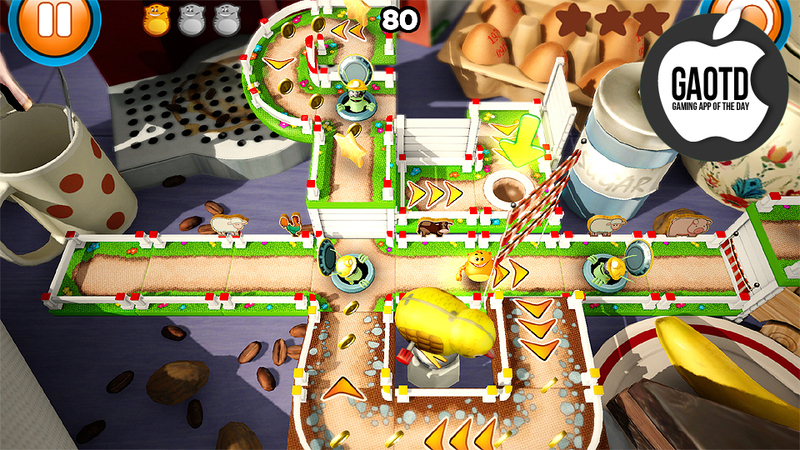 Where the game adds a relatively unique element of puzzle-solving is that after the levels where skills are introduced, the player gets to decide where to place them. So a complex course will be laid out with room for, say, two or three alien placements, and the player has to decide (through a bit of trial and error as well as logical reasoning) where the ability to jump or change direction will be of the best benefit. Fibble also takes advantage of being on a mobile platform: if you get stuck in a corner or run out of momentum, you can tilt your device around to shake your roly-poly guy loose. I played Fibble on an iPod Touch, and while it works perfectly well and runs smoothly, the scale of the levels and the sheer amount of detail in them would clearly benefit from a larger screen. For those who have an iPad available, that's the way to go for this game.